I wrote some songs, that wouldn’t work with my bands, while I was waiting for a complete change of the life I had before (well, this is probably another story…). So it all started with my guitar, certain effects, a new midi-keyboard and a computer. The first weeks passed away as I had to learn something about using my virtual recording gear, after that I produced several tracks in another wide stretch of time. After a few months of sweat, anger and work I had an output of about 10 songs, completely mixed and mastered. Awesome feeling! I was happy and proud and – I threw it all away… Well, of course I liked the instruments and sounds, at least somehow, I liked the melodies and for sure I liked the songs as a whole, but… I needed more! I needed REAL drums, a REAL piano and other non-virtual instruments. And, maybe most important, I needed REAL voices, I mean REALLY good singers, because my so well planned electronic-ambient-guitar-chill-out-whatever album was in actual fact going to be a POP album, maybe an alternative-pop-ambient album, or better: an indie-singer-songwriter-folk-alternative-pop-ambient-chill-album! So another year of rehearsing, recording, erasing, re-recording, mixing and mastering followed. For a limited period of time I played in a band again – with a bass man, a drummer, a trumpet player and two singers. Meanwhile, after taking a really long road, there was this album, pure and organic instrumentation combined with ambient sounds and electronic elements, voices, guitars, beats, REAL drums and more. That’s what I wanted, that’s what I’ve got. My soul is deep-rooted in most different musical styles, so my musical in- and output is kind of versatile. In my opinion a really good pop song has to come up with a devastatingly, emotional melody and a groovy rhythm, but it has to be kind of edgy anyhow. As a guitarist the “six-stringed axe” means still the most familiar form of expression to me, so this is one of the common themes of the whole album, beside the application of harmonic voices and melodies. Meanwhileproject.ltd is M. Adam, family guy, musician and teacher. Today is Sunday is his first official release as a solo artist. He also plays guitar in the two alternative rock bands Lunatic Skydance and Concerto HiFi. M. Adam lives and works in Cologne, Germany. 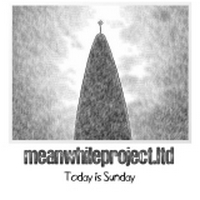 Today is Sunday by Meanwhileproject.ltd is licensed under a Creative Commons Attribution-Noncommercial-Share Alike 3.0 Netherlands License.